Kumārajīva was one of the early translators of the Buddhist canon into Chinese. His father’s lineage was reputedly Indian, while his mother was from the elite of the city of Kucha, on the northern edge of the Tarim basin. It was one of the cities where a form of Tocharian was spoken. This enigmatic Indo-European language family is extinct and known from only a few examples in this region of the world (the different forms of Tocharian seem to have been mutually unintelligible, suggesting a long history in this region of the world for these languages). But Tocharian was not the only Indo-European language group that was represented in the Tarmin. Along the southern and western edge of the Taklamakan Iranian dialects were more common, such as in the city of Khotan. Over the last 1,000 years, the Tarim Basin has undergone major changes. First, the collapse of the ancient Uyghur Turk Empire resulted in their retrenchment to the Tarim Basin. A previously pastoralist people, they became settled city-dwellers. By the time Genghis Khan rose to power, the Uyghurs had become a predominantly Buddhist people, with a focus around Turpan. They seem to have absorbed the predominantly Tocharian city-states of the eastern portion of the Tarim Basin. But after 1000 AD a second change began to occur. A group of Turks, who spoke a Karluk dialect, converted to Islam and conquered Kashgar in the west of the Tarim Basin, and began to push eastward, conquering and converting the Buddhist city-states in turn. By 1400 the cultural expansion and military conquest reached the eastern fringe of the Tarim Basin, as Turpan and Hami were absorbed into the Islamic cultural sphere. With this, a new identity unified the city-states of the Tarim Basin. In language they spoke Karluk dialects, and in religion they were Muslim. In the 20th century the Uyghur ethnonym was resurrected in what was known as East Turkestan, but the cultural descendents of the ancient Uyghurs are actually the Yugurs (whose traditional language descends from that of Old Uyghur). 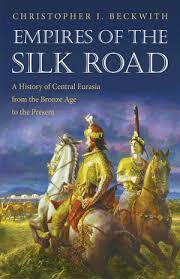 This narrative will be familiar to anyone who reads a book such as Valerie Hansen’s excellent Silk Road. 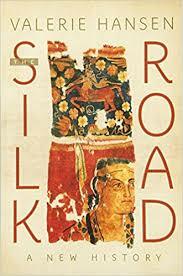 Hansen in particular focuses on the period when the Tarim Basin was at some equipoise between the west, east, and the south, with Sogdians, Turks, Chinese and some Indians, all being part of the dramatis personae of the cities of the Silk Road during the heyday of the Tang dynasty. And none of this should be surprising. 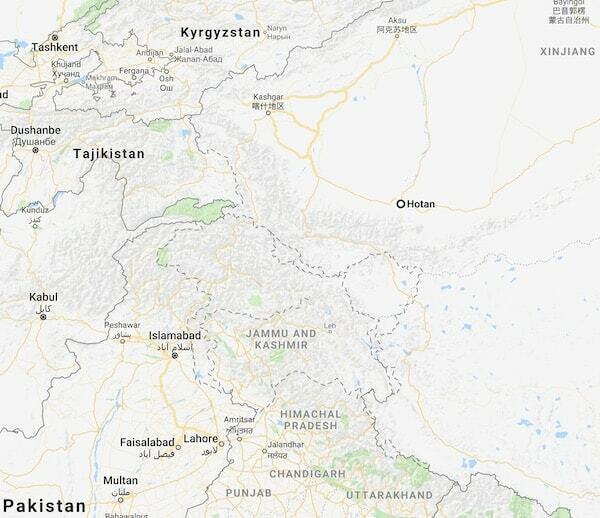 Though this region of the world is divided by the highest mountains on earth, the geographic distance between Northern India, Transoxiana, and the Tarim Basin is quite minimal. 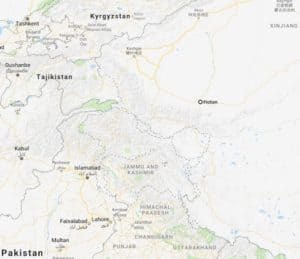 As the crow flies, New Delhi is less than half the distance from Hotan as Lanzhou, in the far western province of China proper, Gansu. The past doesn’t always map easily onto our contemporary topographies. Some of the earliest Chinese contacts with Buddhism was through the devotions of an often blue-eyed people whose physical type was European if anything, who had no doubt learned of the religion ultimately through a chain of transmitters that went back to brown-skinned South Asians. This world did not match the demarcations which we take for granted today. It was a thing different. Normally when I’m enjoining people to think outside of the boxes that they’re used to thinking in, I’m talking to people of white European descent, around whom the world has revolved for several centuries, and around whom they assume the world will revolve until the last day of universe. But today I’ll point to another group, and that is Indians. A friend forwarded me this erudite post on Medium, The Rāma Story and Sanskrit in Ancient Xinjiang. It received 324 claps, which in my experience means that tens of thousands of people at minimum have read this piece. The bolded sections are misleading. The italicized section is correct. There was a great deal of Indian-Tarim Basin interaction. Sometimes directly. Sometimes through intermediaries (Sogdians). But it is simply wrong to imply that this is “Indic culture” in a way that communicates to the audience reading it the proper state of the facts. First, the author makes some statements about the genetic connections of modern people in the Tarim Basin and Indians which are false. He does link to some papers, but they are old, and lack the power to really get at the questions that would allow us to accept or reject the hypothesis of affinity. Since the HGDP has some Uyghurs in the dataset it’s easy to pull them, and compare them to various South Asians, Iranians, and Han Chinese. You see a bit of an admixture cline here from the Han Chinese samples, to something more West and South Eurasian. If you run the cline outward toward the West and South Eurasians, it lands somewhere between Pathans and Iranians. Let’s run Treemix with 4 migration edges. You see the results…. I believe most of the Iranians in this data are sampled from the west of the country. This explains the contrast, where Pathans are more South Asian, and more like Europeans, than the Iranians (at least when not taking into account the migration edge). The steppe genetic impact seems to have stronger in Turan and Khorasan, than the classical heart of Persian civilization in the Fars. The gene flow from the base of the Lithuanian-Pathan clade to the Uyghurs is indicative to me of the steppe genetic influence in this region, perhaps starting with the Afanasievo culture, and later the expansion of the Andronovo complex. These data don’t reject the thesis that the Tarim Basin in the years before 1000 AD were dominated by “Indic culture.” That is because Indic culture is separate from the predominant element that characterizes Indic genes. There was almost certainly some gene flow from northwest India into the Tarim Basin. But it was likely relatively modest. Nevertheless, it is quite possible to characterize someone as having been substantially Indic in their cultural orientation no matter their genetic provenance. 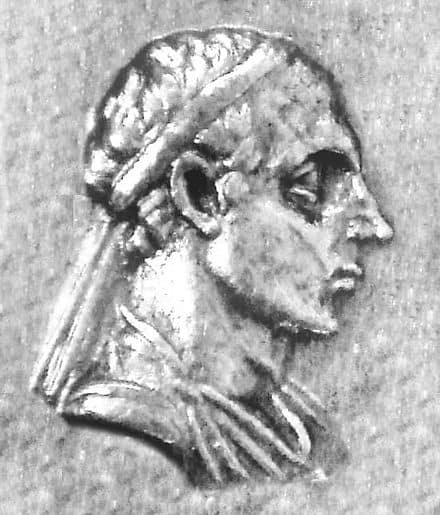 The great Greco-Bactrian king, Menander, seems to have been a patron of Buddhism, which was then still perceived as a fundamentally Indian religion. In the centuries around 400 AD the Chinese still described Buddhism as a foreign “Western religion,” in particular, from India. Indian translators of Buddhist texts are a common presence in China and elsewhere in East Asia during this period, because the original works were in Indian languages. Meanwhile, Chinese Buddhists made pilgrimage to India, in part to retrieve texts from the great ancient monasteries. But by the end of the Tang dynasty Buddhism was no longer thought of as simply an Indian religion. Though Confucian and Daoist critics never failed to point out its foreign origins, it was clearly indigenized. By the Song dynasty no more Indian translators are mentioned. And, by this period Buddhism in South Asia itself was in serious decline, first in the face of a newly vigorous set of religious practices which we call Hinduism, but also due to the predations of Turkic Muslim invaders, who destroyed many of the great monasteries. The primary takeaway here though is that the semantic pointers we provide to the audience often give them implications which are not warranted. For example, when scholars describe Classical Greeks as ethnocentric Europeans, that misleads many modern people into thinking that the concept of European as we understand it today entailed the same things then that it does today. The Classical Greeks were part of a broader Mediterranean civilization, and culturally at least as distinct from the peoples of Northern Europe as they were those of the Levant. Their ethnocentrism was of a very different kind than that that developed in Europe in the 19th century, after the Congress of Vienna with the synthesis between resurgent Christian chauvinism and biological essentialism. 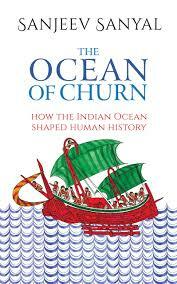 A similar issue crops up in discussion of ancient India and Indians. In Sanjeev Sanyal’s The Ocean of Churn he assumes that the Indo-Aryans who clearly were part of the military elite of the Bronze Age Syria state of Mitanni were Indian. First, the reality is that in the Bronze Age “Indians” as we understand them today did not exist. While Mitanni flourished in the Upper Euphrates region, the great cultural complex that was the Indus Valley Civilization was unwinding, to be succeeded by a simpler society. The biological and cultural synthesis that we think of as Indian today had not come into being in the totality. Second, the Indo-Aryan elite of the Mitanni (who had quickly switched their language to the Hurrian of their subjects) likely never had any experience of India. Rather, in the coalitions of steppe agro-pastoralists the Indo-Aryans were distinct from the Iranians, and one branch of the former seems to have pushed westward into the Near East, and another gone eastward to India. Ultimately, what is in a label? 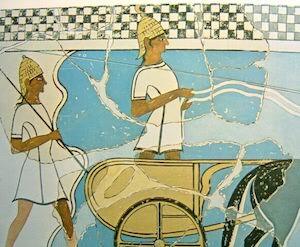 The Greeks of the Mycenaean period spoke Greek. They worshipped some Greek gods that persisted down to the Classical period. But their descendants had only the vaguest of ideas about these people. When archaeologists of the 19th and 20th century excavated Bronze Age sites in Greece they assumed that people were not Greek. The assumption was that the Greeks of the Classical period descended from people who had come down from the Balkans during the Dark Age (the Dorians). The decipherment of Linear B shocked the world. These people spoke Greek. But culturally they were very different from the Classical Greeks. To understand the world we must reassemble and filter it in categories what are comprehensible to us, that give us meaning. But we should never confuse the categories and concepts that are our tools for the reality that is out there. Our words always collapse distinctions, and erase subtleties. The further we go back into the past, the greater the disjunction between our categories and the details that they propose to bracket. In the specific context of Indian history and the controversies and co-options I see bubbling to the surface due to the disruptive impact of genetics, is the fact that for many of the most motivated protagonists history began with Mahmud of Ghazni. For some, the Indo-Aryans are seen as precursors to the Turkic Muslims. And so the alien becomes the indigene, and the indigene becomes the alien. For others, the Indo-Aryans are the root and basis of the Hindu Rashtra. Due to this they must by necessity be grounded in Bharat Matā everlasting. The truth from where I stand does not suggest that either narrative is correct. The Indians of today, whether from the southern tip of the subcontinent, or the high fastness of Kashmir, are not comprehensible without the Aryans of the Vedas. But the Aryans are of the Vedas are not comprehensible without the the Punjab, without their residence and immersion in the Indian subcontinent. They came from elsewhere, but they became who they were because of their emulsification in the matrix of South Asian people and environments. Similarly, Central Asia, from Xinjiang to the Caspian, from the fringe of Siberia to the edge of India, occupies a central pivot on the World Island. Both receiving and transmitting, over the past 2,000 years it has transformed itself many times, and yet retained some elements of continuity. There is no reason that India, China, or Russia should claim it as a natural extension of their own civilizational development. It was, and is, part of them all and yet not all of any. The Uyghurs I come across at a local restaurant are the most phenotypically variant people I’ve seen. Some look like straight up Vikings; some look completely East Asian; most like everything in between. It’s really incredible. Btw the food is *amazing* as well. Brings up a question for me: assuming a nearly 100% endogamous population initially composed of several highly divergent populations, would there be a time when people’s phenotypes completely converge to one “look”? If yes, how long would that take? Or will there always be some variance where phenotypes similar to one of the founding populations will be expressed? I’m not colourblind at all & it is really annoying. Often, you have to know in advance where the populations probably are in relation to each other, else you wouldn’t be able to differentiate. So, I second your request. They would “converge” to whatever selection pushes them. Selection makes a population homogeneous, not mixture, not even purity. is a indian american computer scientist, who has been heavily involved over the years in pushing out of india/indigenous aryan theories. He claims to fame is the use of “archaeastronomy” to prove things in the Vedas and claim the vedas have a numerical code of some sort to them. Of course he has a huge following among the hindutva crowd in india and hindutva leaning indian-americans, which is probably where alot of the “claps” come from. I think from his wiki he has been awarded a position in the current BJP’s government science council. Something to keep in mind is that admixture analysis can often be misleading, not reflection directional gene flow, but rather may be a signal from a common ancestor (ghost population). In the case of Iranians, I often see something related to the south Indian component show up, however, in Wangs 2018 study the S. Indian component also showed up all the way in Western Hunter Gatherer groups, making it obvious that such ‘admixture’ is not real. 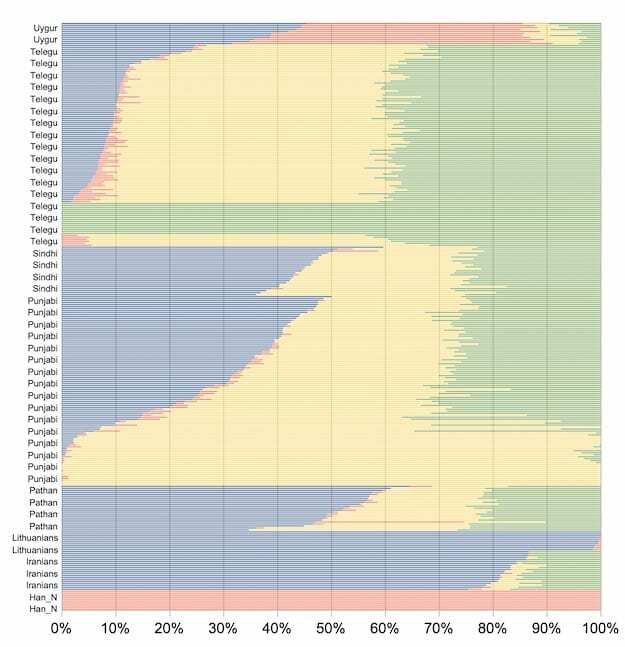 Nonetheless, given the distribution of diagnostically Indian haplogroups, it is clear that Iranians, particularly in the South East of Iran, have actually had received small, but significant (peaking 4-8%), amounts of gene flow from India in recent history. Something to keep in mind is that admixture analysis can often be misleading, not reflection directional gene flow, but rather may be a signal from a common ancestor (ghost population). that’s why you use ancient groups and test multiple phylogenetic models. Yeah, I was confused about Razib responding with the Tolkien post… either it was the wrong link or the connection to the discussion was way over my head. The areo mag link Roger posted makes more sense (thanks). To be more clear about what I was asking: it was a hypothetical question about time depth required for more homogeneity, and about the exact genetic underpinnings that would answer the question. These conditions can’t exist in reality, but let’s assume a scenario where three distinct populations land on an island, interbreed completely randomly, and aren’t subject to any other forces like selection, etc. 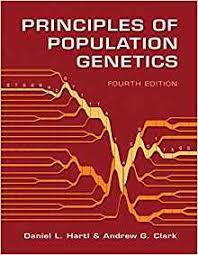 It seems to me that as time approaches infinity the population will homogenize to a singular genetic structure and physical phenotype and no one born will look ~100% like one of the three original populations (of course there will still be some level of variance — we’re not talking about clones). So the question was how long it would take in this scenario to reach some subjective level of homogeneity, e.g., where an outsider would easily identify a member of a population as part of that group? In reality I see evidence of groups homogenizing and groups maintaining phenotypic diversity. To go back to my Uyghur anecdote: there are Uyghurs that look nearly entirely northern European, and others that look entirely east Asian. Uyghurs as a distinct ethnic concept are very roughly ~1 millenia old. Ashkenazi Jews have been endogamous for at least the same amount of time yet still exhibit an incredible range of outward appearances: I know some, in the same family even, that look nearly Yemeni while others look northern European. As a counter example, Han Chinese do not exhibit anything near that level of phenotypic diversity, and while obviously there are many other forces in play, I was simply wondering how much of a factor is just time (I guess a better term is generations). Re; what an outsider would tell, I expect there’s a bit of an effect where these things are easier to spot when you have a reference population relatively close to the unadmixed population. If there were no Ainu left, people would have a harder time seeing certain Japanese and picking up that there is still some ghost of Jomon phenotype characteristics present in the population. Regarding the decline of Buddhism in South-Asia, it should be noted that the bulk of the violent destruction suffered by Buddhists in modern-day Afghanistan and Pakistan was done by pre-Islamic steppe peoples (similar to the Huns). By the time Muslims arrived, Buddhism was on death’s door. Also, the decline of Buddhism in inner-India wasn’t just an issue of reinvigorated Hindu dogma overpowering Buddhist thought, it was accompanied by various acts of violent repression against Buddhists and their institutions. By the time Muslims arrived, Buddhism was on death’s door. 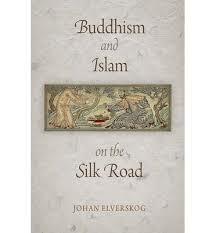 this argues that that is not the case at all: Buddhism and Islam on the Silk Road. I’m a bit confused about what you are taking from Elverskog here, as a brief reading of the text seems to confirm what I’ve said regarding Buddhism dying before Muslim arrival. “When the first Muslim armies arrived in Central-Asia in the 7th century…it appears as if Buddhism had largely dissapeared”. Regarding Buddhism in North-West India (modern-day Pakistan), he describes the area Muslim armies found as, “dilapidated”, that “money was certainly there, but not necessarily Buddhists”, and that “Buddhism had failed in the region”. Again, this jives with the major scholarship on this topic today. 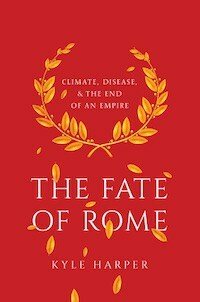 That Buddhism if not already dead, was on death’s door before Muslims arrived, and that while they certainly helped it along (though Elverskog claims the damage done wasn’t physical but economic), they can’t in anyway be labeled a major factor in its decline, especially through any fantasies about violent extermination/conversion. the term “death’s door” is pretty extreme. in the book he specifically says that the muslim understanding/perception of buddhism was totally different for al-biruni vs. the earlier centuries, when it was still a living tradition. how are we going to quantify this disagreement? i’m not sure i’m right, but i have no idea how you can say “death’s door” in the 7th century….. The language I used was extremely unhelpful, I’ll try again. 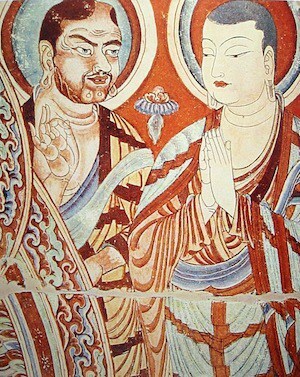 Buddhists existed in Central-Asia and North-West India when Muslims arrived on the scene. Their “civilization”, both in terms of prosperity, influence in the area, and overall numbers, had declined dramatically in the centuries before Muslim arrival (due largely to a combination of central-Asian invasions and Hindu repression). While Muslim rule saw the continued decline of Buddhism in these domains, it did not hasten it, and certainly was not defined by violent repression. In fact, as the text you cite observes, Buddhism lasted longer in Muslim ruled areas than it did in neighboring Hindu kingdoms. I think its important to note this, because while the above is the agreed upon scholarly narrative of this topic (more or less), the pop-version promulgated by anti-Muslim activists (typically either Western or Indian right-wingers), portrays the exact opposite. That Hindus and Buddhists were living in a happy Dharmic fairy-tale land, with Buddhism declining because Hindus were just so persuasive and ideologically attractive. Then savage Muslim rode in on horseback, and either killed, converted, or drove out Buddhists from Northern-India/Central-Asia, thus ending Buddhism’s storied history in the region. I commented originally, because I saw the worrying signs of this fairytale in your article, which attributed Buddhism’s decline here to Muslim violence and Hindu theology..
i don’t have much objection to that framing. though not sure it’s the right one (would need to read more).